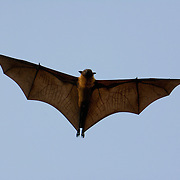 Bats are the second largest order of mammals (after the rodents), representing about 20% of all classified mammal species worldwide, with about 1,240 bat species divided into two suborders: the less specialized and largely fruit-eating megabats, or flying foxes, and the highly specialized and echolocating microbats. About 70% of bat species are insectivores. Most of the rest are frugivores, or fruit eaters. 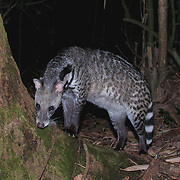 Civets is the common name is used for a variety of carnivorous mammalian species, mostly of the family Viverridae. 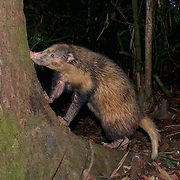 They are small, lithe-bodied, mostly nocturnal mammal native to tropical Asia and Africa, especially the tropical forests. 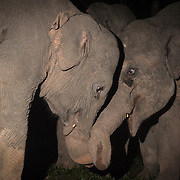 Wild Asian or Asiatic Elephants (Elephas maximus), sometimes known by the name of one of its subspecies, the Indian Elephant, is one of the three living species of elephant, and the only living species of the genus Elephas. 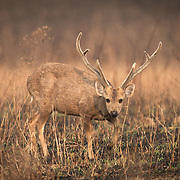 It is the largest living land animal in Thailand. A selection of wildlife photographs showing some of the mammals found in the National Parks of Thailand, that we do not cover in our other galleries. Primates belong to class Mammalia of phylum Chordata. They include apes, monkeys, and humans. 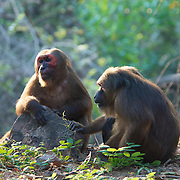 In taxonomy, the order Primates is the highest order of mammals. They are placental mammals with good eyesight and flexible hands and feet. 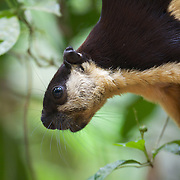 Rodents (from Latin rodere, "to gnaw") are mammals of the order Rodentia, which are characterized by a single pair of continuously growing incisors in each of the upper and lower jaws. About 40% of all mammal species are rodents. Thailand's wild cats are extremely elusive. In particular, its tigers are extremely rare as well as cryptic and few pictures exist of them. It is estimated that approx 200 tigers still exist hidden deep inside Thailand's forests. 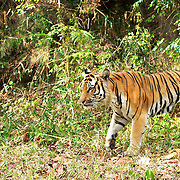 Which is the largest population of the endangered Indochinese tigers in nay country in the world. Since 2010 we have been using automated cameras to capture glimpses of these rare creatures deep inside Thailand's dense forests. All of the cats shown in these galleries are wild and photographed in their natural habitats. ThailandWildlife shows no pictures of captive animals in any of its galleries. 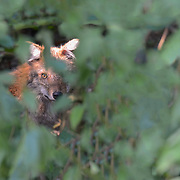 The wild dogs of Thailand's National Parks and Wildlife Sanctuaries consist of the Asian Wild Dog or Dhole (Cuon Alpinus) and the Golden or Asiatic Jackal (Canis Aureus).